Some falsely believe chickenpox is a harmless disease, but it can lead to death in children and adults who suffer complications. Kentucky's antivax Republican Governor Matt Bevin said in a radio interview today that he exposed his children to chickenpox intentionally so they would catch the highly contagious disease, and become immune. Bevin was on Bowling Green radio station WKCT earlier today, and revealed that his kids were "miserable for a few days" after they got chickenpox, and "they all turned out fine." Bevin and wife Glenna have nine children, four of whom are adopted. Governor Bevin said parents who fear their children will contract chickenpox and want to have their children vaccinated should do so, but that government should not mandate vaccination. In the interview, Bevin also suggested that the government stay out of mandating vaccines. In Kentucky, varicella (chickenpox) is among vaccines mandated for all children entering kindergarten, though parents may seek religious exemptions or provide medical proof that a child has already had the disease. “And I think, why are we forcing kids to get it?" 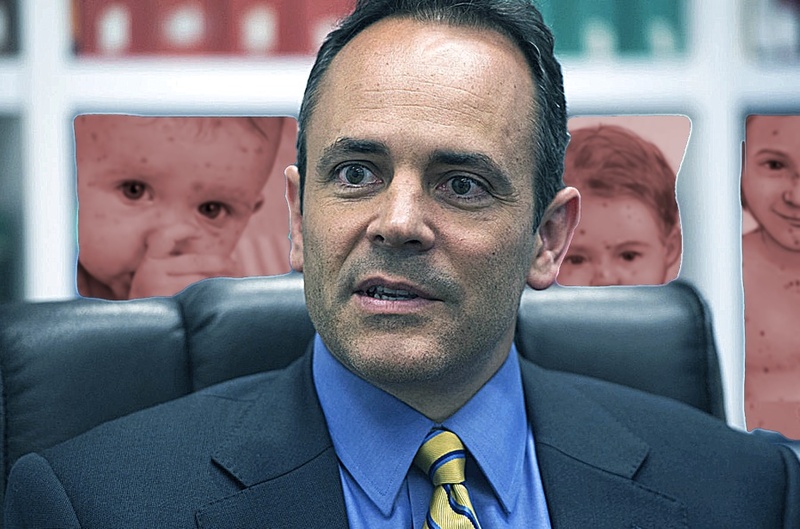 Bevin said in the radio interview, speaking about the chickenpox vaccine. "If you are worried about your child getting chickenpox or whatever else, vaccinate your child. ... But for some people, and for some parents, for some reason they choose otherwise. This is America. The federal government should not be forcing this upon people. They just shouldn’t." Jacobson said he recommends vaccines as a safe and effective way to prevent disease. "We're no longer living in the 17th century," he said. "I really recommend to my parents that they vaccinate their children, that they do it in a timely manner, and they recognize they are doing the right thing for their children." Bevin's comments followed news reports this week of a chickenpox outbreak at a Northern Kentucky Catholic school, where at least one student reported not being vaccinated for religious reasons. Chickenpox is an infectious disease that produces fever and itchy skin blisters. It is preventable with a vaccine that became publicly available in the U.S. in 1995. Many people falsely believe chickenpox is a harmless disease, but it can lead to death in children and adults who suffer complications. "On more than one occasion, I have had a patient who is a pregnant woman who became exposed to chickenpox and became ill and developed pneumonia. Either she or her baby or both did not survive." Carrico said people should get the chickenpox vaccine and other immunizations not just for themselves, but for others who may not be able to do so for medical reasons and who are susceptible to infection. About 20% of the total posts were found to have been generated by seven anti-vax Pages.